Yard applied concrete coating following the impingement method is carried out over the Coal tar enamel coating (CTE) on the entire outer surface of the pipe up to a specified thickness. It is applied at a high velocity against the external surface of the pipe to produce a hard, tight-adhering coating of the specified thickness and simultaneously wire -meshed. Hot flame tape (coating) or cold tape is using in underground piping for protection from Corrosion. These pipes have various usage such as it can be used in tube wells, can be used for underground & on ground pipelines. 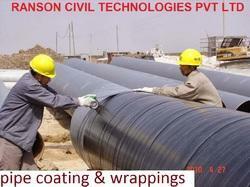 Our company holds vast experience in this domain and is involved in providing Pipe Coating Services. Professionals of our firm are highly dedicated to provide FBE External Pipe Coating Services to all precious patrons. We have ensured the perfect finishing of external pipe coating. Coating work is done under the guidance of skilled professionals who hold deep expertise in the relevant work. Being a noticeable firm of market, we are rendering PU Pipe Coating Services. This service is handled by experts who use advanced technique to render this service as per customer’s demand. In this service, we use advanced coating services. The coating nProtect helps enhance aesthetics to the two wheelers by increasing surface gloss levels and providing a very easy to clean surface. nProtect also helps protect against corrosion, chemicals and physical damage. Our coating is highly durable and we guarentee its performance for 3 years. Galvanized Iron Pipe Coating Service is provided by us to patrons according to their requirements. Captivating on the skills of our professionals, we are involved in rendering Pipe Coating Service. On the forefront of mechanized yard coating in India and abroad, PSL’s strength lies in its commitment to quality and ability to implement diverse projects efficiently. We are well-efficient in providing our clients specifically developed Pipe Valve Coating Service which is available at fair market price.